During the early 1850s, Millet had established his simple, naturalistic style on rural ‘genre’ subjects, faithfully expressing what country life was really like for the poor. Jean-François Millet (1814–1875), The Knitting Shepherdess (1856-57), pastel, 33.7 × 25.4 cm, Saint Louis Art Museum, Saint Louis, MO. Wikimedia Commons. 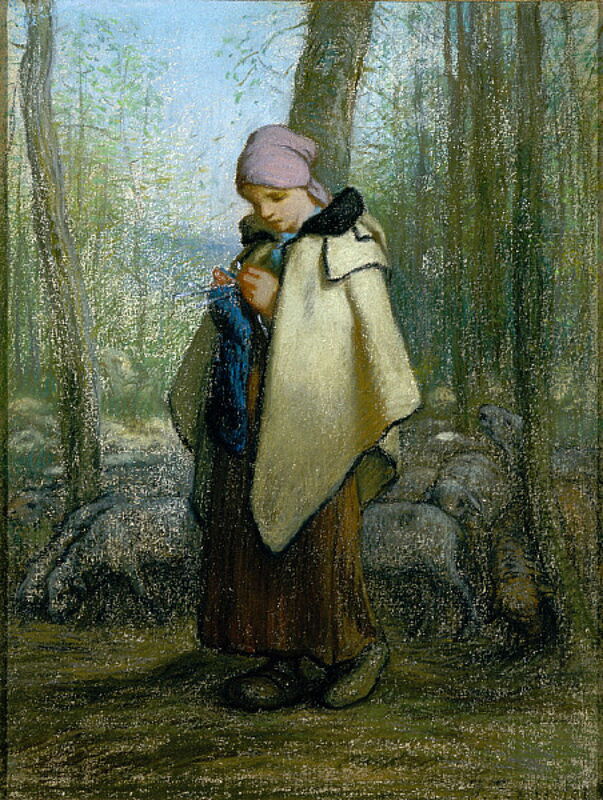 His pastel of The Knitting Shepherdess (1856-57) continued his pastoral theme, showing a young woman engaged in knitting as her flock grazed in broken woodland behind her. She is depicted very simply, almost in illustrative form. Millet’s hope for the Salon of 1857 was his substantial painting of The Gleaners (1857). His vision was in complete contrast to Breton’s highly successful painting of the same name, which had been so well-received at the Salon in 1855, which I show below. The distant wagon, grainstacks, and village may appear common elements, as are the three women bent over to glean in the foreground, but that is as far as the similarities go. 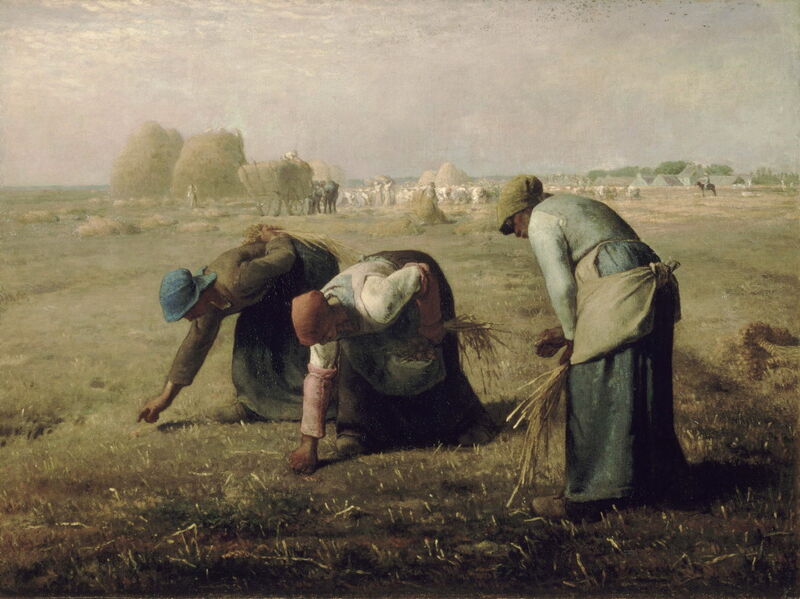 Millet’s composition is sparse, concentrating on those three figures. There are no distractions, such as a garde champêtre to add any colour or humour: it is about the rural poor, who made ends meet by salvaging scraps after the harvest had been cut. This is unavoidably about poverty, and the sector of the population who just managed to survive each winter. It smacked of socialism, and got the thumbs-down from both the rich and the middle classes. Although Millet sold The Gleaners after it had been shown at the Salon, and it brought in much-needed money, this painting did not appreciate in value until after his death. It finally entered the Louvre after the death of its owner in 1891. Millet continued to document the lives and work of the country people around Barbizon. Among these paintings is his delightful First Steps (c 1858), showing an infant about to break free from mother’s arms and walk for the first time towards their father. 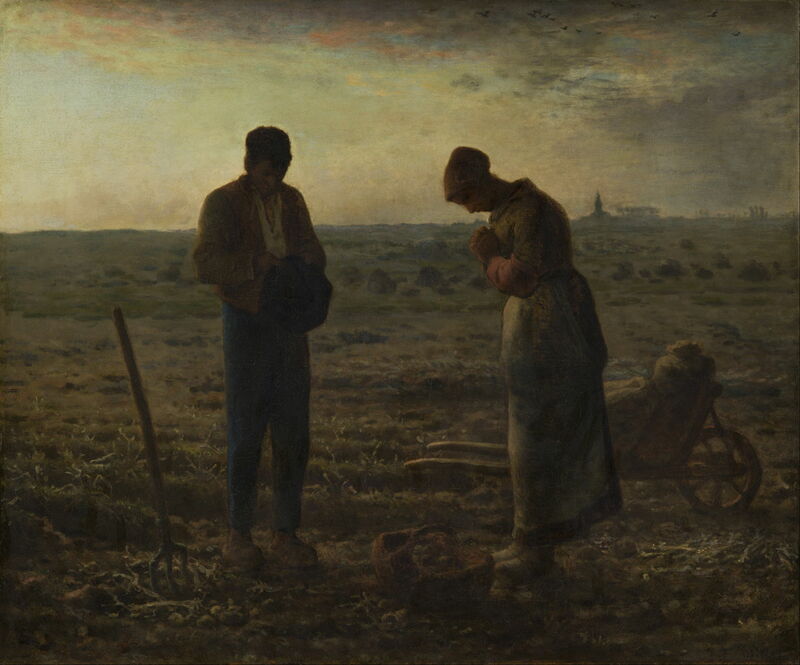 But his most famous single work, L’Angélus (The Angelus), was completed around 1857-59 too. 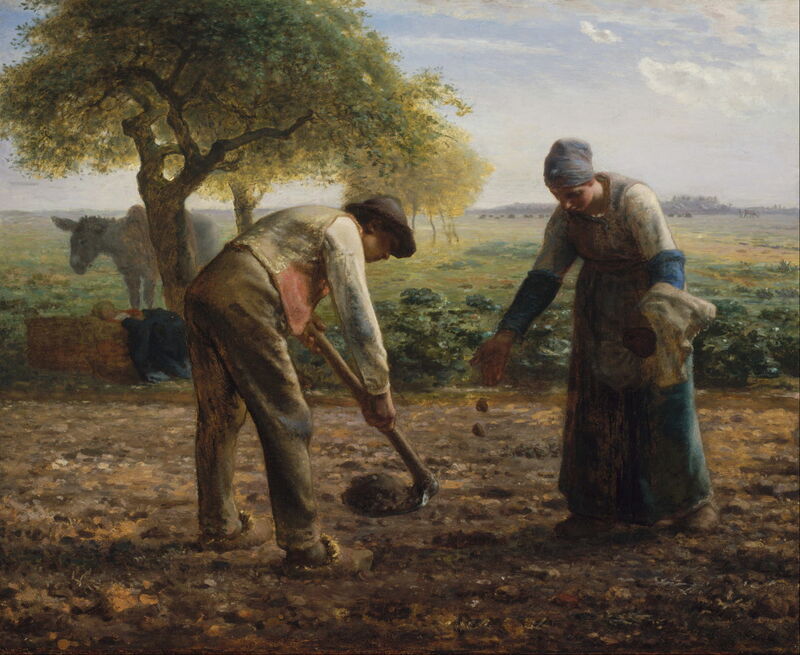 This had been commissioned by the American collector Thomas Gold Appleton, as Prayer for the Potato Crop, but underwent modification before Millet gave it its present title. At some stage, it is thought to have included a child’s coffin, but that was overpainted. It shows a couple, praying the Angelus devotion normally said at six o’clock in the evening, over the potatoes they have been harvesting. It is dusk, and as the last light of the day fades in the sky, the bell in the distant church (whose steeple was a late addition, after Appleton failed to collect the painting from Millet) is ringing to mark the end of work, and the start of the evening. Next to the man is his fork, which he has been using to lift potatoes from the poor, stony soil; his wife has been collecting them in a wicker basket, which now rests at her feet. Behind them is a basic wheelbarrow, which has a couple of sacks of potatoes on it, ready to be taken home. In the gathering dark, viewers often misread the barrow and think that it contains a small child. 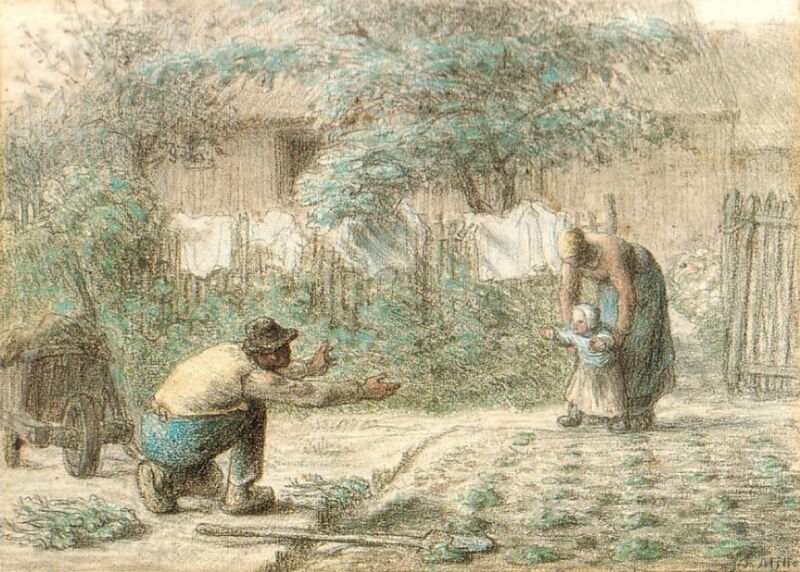 Its motif dates back at least to Millet’s chalk drawing of The Potato Harvest in 1853. With the hostile reception of The Gleaners, Millet did not exhibit this painting until 1865, although he had sold it in 1860 for a meagre 1,000 francs. 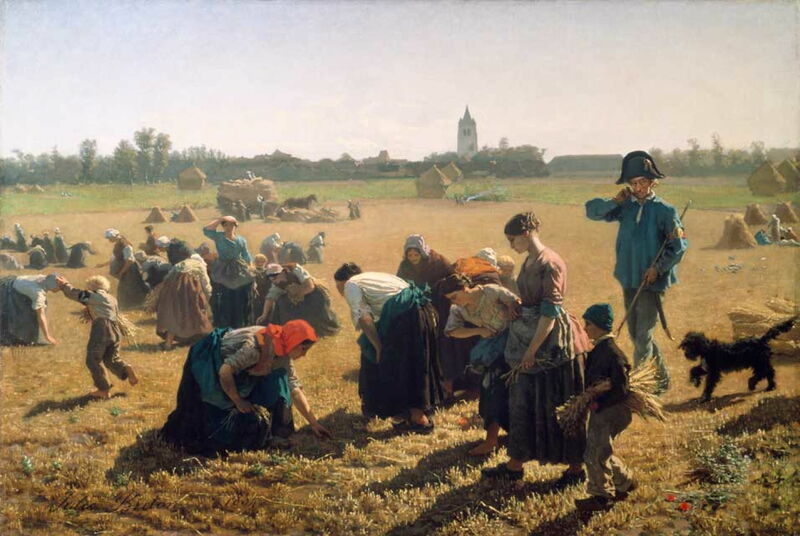 Since Millet’s death, it has become enormously popular, and in 1890 was sold for 750,000 francs. Jean-François Millet (1814–1875), The Sheepfold, Moonlight (1856-60), oil on panel, dimensions not known, Walters Art Museum, Baltimore, MD. Wikimedia Commons. 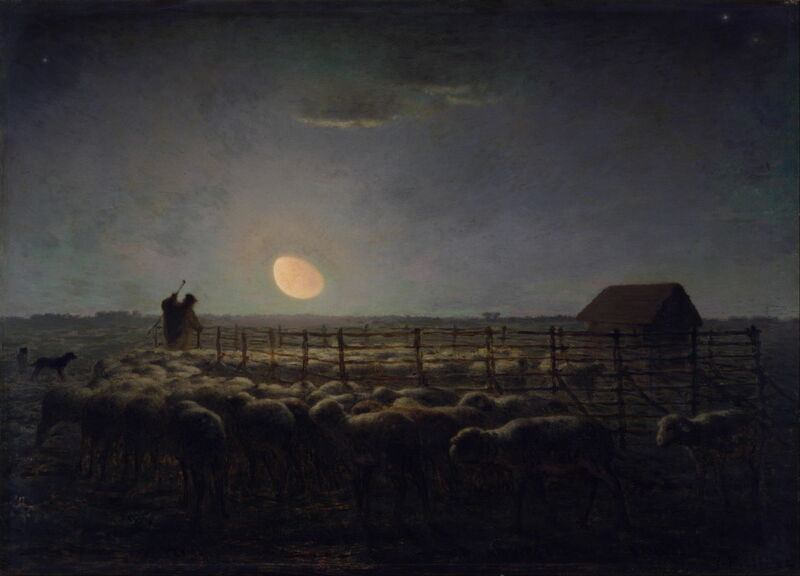 The most famous of Millet’s few nocturnes followed: The Sheepfold, Moonlight (1856-60). This beautiful painting shows a shepherd working his dogs to bring his flock into a pen on the plain near Barbizon. He is doing this under a waning gibbous moon, which lights the backs of the sheep. Jean-François Millet (1814–1875), Death and the Woodcutter (1858-59), oil on canvas, 77.5 x 98.5 cm, Carlsberg Glyptotek, Copenhagen, Denmark. Wikimedia Commons. In Death and the Woodcutter (1858-59), Millet brought together his social realist paintings of the poor and his early narrative paintings. An elderly woodcutter has collected a large bundle of firewood, but is slumping to the ground, his walking stick having fallen in front of him. 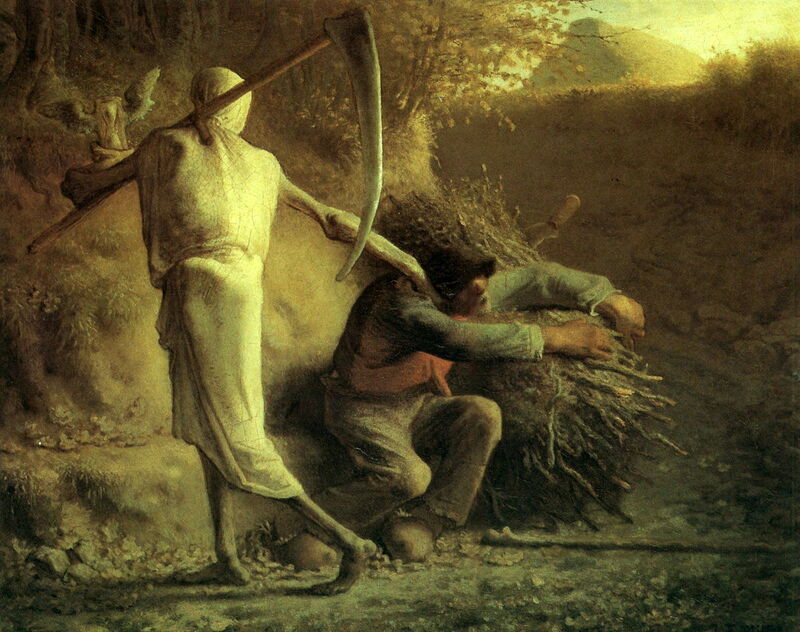 The figure of death, complete with a scythe on his shoulder and a winged hourglass (sand timer), grasps the woodcutter by his shoulder as the moment of his death approaches. Millet’s setting for this painting is unusual: the two figures are on a track which has been cut about three metres (ten feet) below the level of the adjacent wheat field, and the thicket at the upper left. The vertical sides make it unlikely to be a dried-up watercourse. Jean-François Millet (1814–1875), The Sewing Lesson (c 1860), charcoal and pastel on cream laid paper, 38.1 x 30.5 cm, Crocker Art Museum, Sacramento, CA. Wikimedia Commons. Another delightful and intimate drawing in charcoal and pastel shows The Sewing Lesson (c 1860). 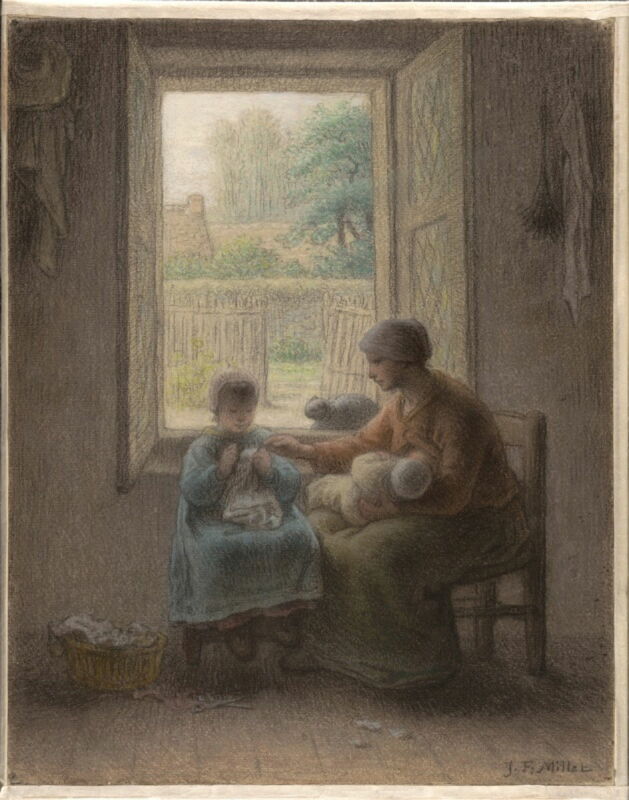 A mother, nursing an infant at her breast, is teaching her young daughter to sew. On the floor, beneath the girl’s feet, is a pair of scissors. They are sat in front of an open window; on the outer window sill is a cat, drawn in a more rudimentary way. Potato Planters (c 1861) shows more agricultural work taking place in the flat fields near Barbizon. The man uses a mattock to cut the hard earth for his wife to drop in seed potatoes. Although potatoes will grow in such conditions, their yield is poor unless the ground has been well-prepared first, normally by ploughing to raise the ridges into which they are usually planted. Behind them, at the left, a child sleeps in a large wicker basket, and the donkey used to carry the seed potatoes is resting in the shade. The man’s working clogs are padded out with straw to prevent chafing of his feet.